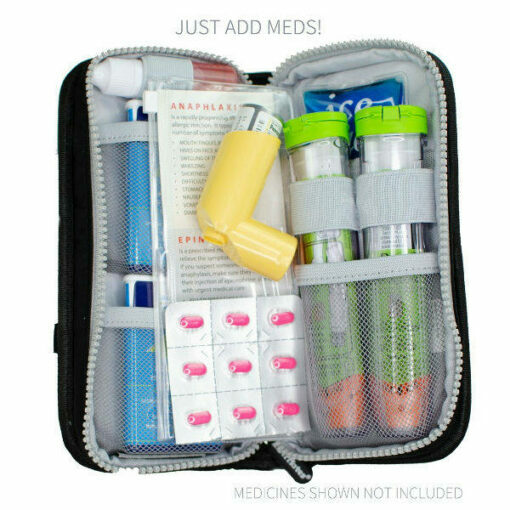 This case can hold 2 adrenaline auto-injectors, extra medications like inhalers or nasal sprays and liquid medications. This insulated EpiPen holder for EpiPen® auto-injectors was designed by an allergy mom so it fills all of your needs for carrying an adrenaline pen. The case has lots of great features like a carry handle, an adjustable belt and an ID flap on the front. The magnetic flap on the front of the case opens up using a tag that reads “Info”. 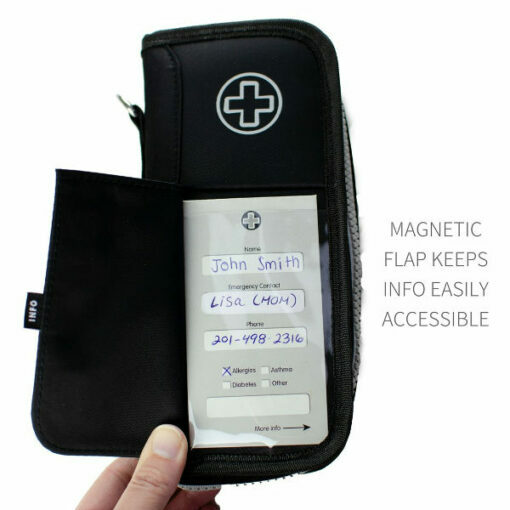 The flap contains a clear plastic pocket with an ID card inside. 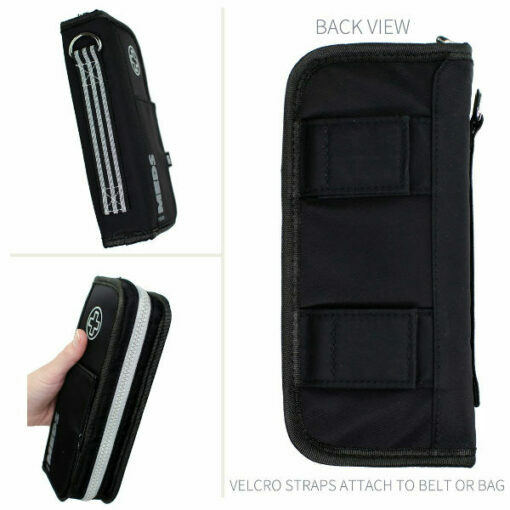 The case comes with an adjustable waist belt that attaches to two velcro straps on the back of the case. These straps can also be attached to the strap of a bag, a belt, or the handle of a stroller. The inside of the case has loops and pockets for your adrenaline pens such as EpiPen®, Auvi-Q®, Emerade®*, Jext® or Anapen® auto-injectors. The loops and pockets are stretchy to make it easy to get the pens in and out in a hurry. They keep your medicines safe and secure and so protect them from falling. 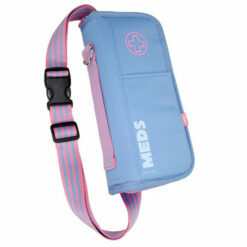 You can also use the pockets to hold other medications like inhalers or nasal sprays. 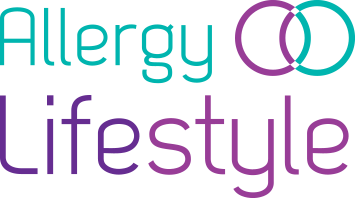 As the case was developed by an allergy mom, it contains lots of little extra features that are great for kids. The case comes with a small 15 ml travel bottle. The bottle has a tamper proof cap and it’s BPA free so it’s perfect for kids. 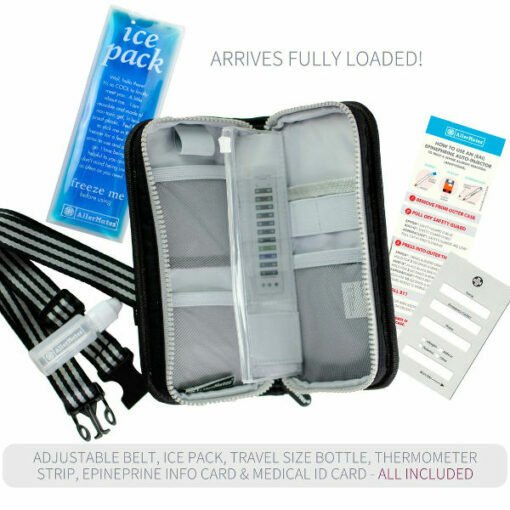 The case also contains a thermometer strip and a reusable ice pack. Insulated case for holding allergy medications. Keeps contents within a 10-degree range of room temperature for up to 6 hours. Designed for kids with fun striped patterns. 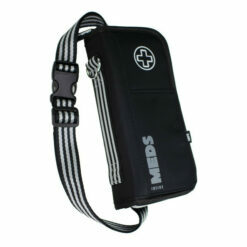 Can be worn around the waist with the included adjustable strap or you can clip it to straps, handles, or bags. Travel sized 15 ml bottle included for liquid medications like anti-histamines. Loops and pockets specifically designed for holding adrenaline pens and other medications. Ripstop fabric and 600 denier polyester exterior. Size: 8.5″ X 4″ X 2″. Please note: The bottle can be opened by pulling off the nozzle at the top. There is a seam between the thread of the cap and the nozzle where you can push upward to get it off. This must be removed to fill the bottle with anti-histamine. 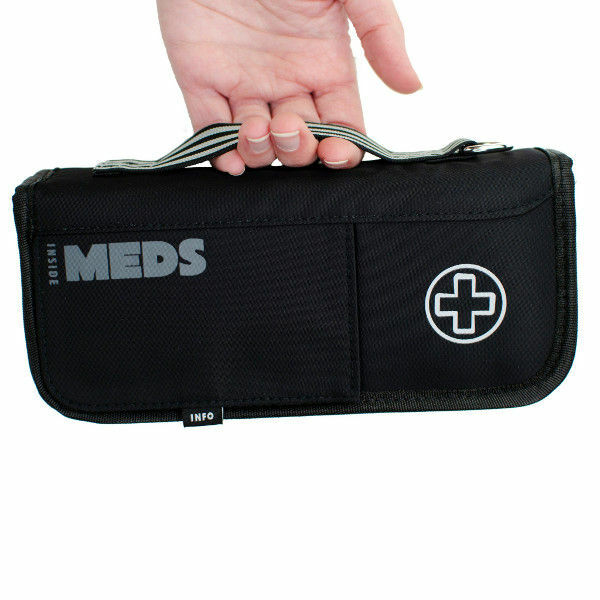 Medications are shown for display purposes only and are not included with the case. *If you are using Emerade pens, please note that though the pens and bottle will fit, there may not be room for additional medications. Please contact us before purchasing if you wish to carry additional medications and we will do our best to check to see if they will all fit in the case. Ordered this for my sons Epipen’s. Delighted with it. Perfect for Epipens and antihistamine. Very speedy delivery. Great product for my 11 year old son. I am very pleased with the quality of the case. I ordered this item for my 12 year old grandson. It is easy to use and compact. .Delivery was excellent. I was very pleased with it. Suitable design for most ages. I ordered it for my 20 year old son. 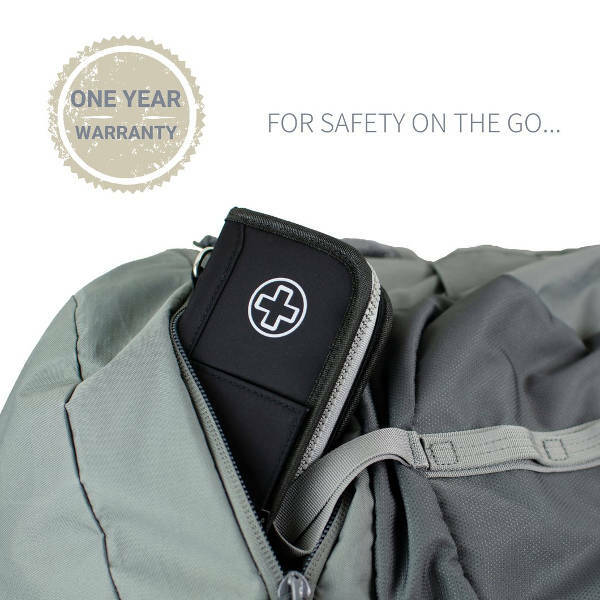 Compact and can also fit in a small bag if you don’t want to wear it around your waist. I was particularly looking for something suitable for fluctuations in temperature. Very fast overseas delivery. Very quick delivery. Quickest overseas delivery I have ever had. Very compact case,good size. Also fits into a small bag if you don’t want to wear it round your waist. Ideal for most ages. I bought it for a 20 year old. I wanted something that would be suitable for temperature changes. I love it now I can keep it on me. So much you can put in there . I will recommended it in case an emergency you have it right there on you.